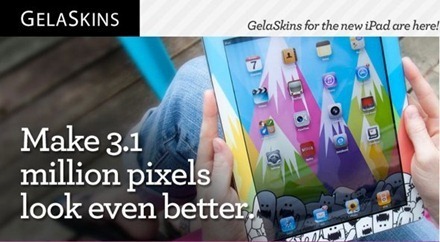 I’m a huge fan of Gelaskins for the iPad. I’ve written in the past about how a Gelaskin for the back combined with the Apple Smart Cover is my favorite ‘outfit’ for the iPad 2. So I’m very happy to see that Gelaskins are already taking pre-orders for their lovely covers for the new iPad. I just ordered my favorite, Dr. Gonzo by Ralph Steadman. Gelaskins for the new iPad go for $29.95 plus shipping, and are due to start shipping on March 19th. Those of you who are buying the new iPad, what are your plans for cases and covers for it?